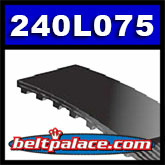 240L075 Synchro-Link timing belt. 64 Teeth, 24" Pitch Length x 3/4" width. 240L075 Synchro-Link timing belt. 64 Teeth, 24" Pitch Length x 3/4" width. Neoprene (black rubber) with polyester cord construction. 240L050 Synchro-Link timing belt. 24" length, 64 teeth. 1/2" Wide. 240L100 SYNCHRO-LINK TIMING BELT. 64 Teeth, 24" Pitch x 1" width.